WASHINGTON, DC: Far too many offenders return to prison within five years of release—a recidivism rate that contributes significantly to over-incarceration and taxpayer expense. In testimony before the Congressionally mandated Colson Task Force on Wednesday, Prisology—a national non-profit criminal justice reform organization—proposed the REACH Act, tax-neutral legislation that will better educate and prepare federal prisoners for reentry, reduce recidivism and save billions in tax dollars. The REACH Act—the Renewing Each Affected Community Holistically Act—creates a revenue neutral mechanism for funding vocational and educational programs for federal prisoners. Such programs improve employment possibilities after release, and reduce the likelihood of recidivism. Modeled after the Crime Victims Fund, the REACH Act funds itself through a series of assessments that are imposed during the criminal justice process. All monies collected are deposited into the REACH Fund. The REACH Fund in turn provides grants to non-profits, community colleges, and other post-secondary educational institutions to fund vocational training programs and college courses leading to undergraduate degrees. The effectiveness of prisoner educational programs on recidivism is widely recognized. A 2013 Rand Corporation study found that: “Inmates who participate in correctional education programs had a 43 percent lower odds of recidivating than those who did not. This translates to a reduction in the risk of recidivating of 13 percentage points.” Such a reduction would decrease the federal prison population and potentially save billions of tax dollars. A newly created office within the DOJ’s Office of Justice Programs—the Office for Restorative Justice, would administer the REACH Fund. REACH will generate tens of millions of dollars a year for re-entry and rehabilitation programs for federal prisoners. Those funds will be protected by requiring offenders who fail, withdraw, or are expelled from REACH funded programs to reimburse the REACH Fund for their cost of participation. Prisology’s testimony was well received by the Colson Task Force, a nine-member, bi-partisan, blue ribbon panel established by Congressional mandate that is charged with examining the challenges in the federal corrections system and developing practical policy responses. The insights shared in this public session by Prisology and other stakeholders helped inform the Task Force as it identifies opportunities for criminal justice reform. Prisology is a national nonprofit organization that was founded in July 2013. Prisology is dedicated to reforming the U.S. criminal justice system through grassroots advocacy, activism, litigation and education. Prisology has offices in Texas and Vermont, and can be contacted through its website at www.prisology.org. MONTPELIER, VERMONT: In a major victory for low level, non-violent drug offenders, the U.S. Sentencing Commission has adjusted its drug quantity penalties downward by two levels retroactively – potentially reducing prison sentences by an average of 25 months for up to 46,000 drug offenders. The sentence reductions and early releases are expected to result in a $2.4 billion savings to taxpayers. Under the retroactive guidelines, known as Amendment 782 or the “Drugs Minus Two” amendment, offenders became eligible to apply for sentence reductions on November 1, 2014, with the first releases occurring on or after November 1, 2015. Key to the Sentencing Commission’s unanimous approval of Amendment 782 was its receipt of over 75,000 comments favoring the reform, mostly prompted by an intensive email, letter writing and social media campaign organized by Prisology. This is the first major victory for the barely year-old nonprofit organization dedicated to criminal justice system reform. “It’s a huge victory for fairness, for prisoners who received overly harsh punishment for minor offenses, and for their families,” says Prisology General Counsel Jeremy Gordon. “It’s also a victory for the nation, with up to 46,000 offenders allowed to return home and to begin contributing to our society and economy again. The decision also reduces overcrowding in federal prisons and could save taxpayers $2.4 billion in prison costs. The U.S. Sentencing Commission initiated the drug guideline revision process in June 2013. “Prisology, only weeks old, sprang into action, and got thousands of support letters and emails sent, requesting an across the board reduction to the federal drug sentencing guideline table,” says Sample. Over 20,000 comments, mostly Prisology inspired, led to the Commission’s unanimous vote for Amendment 782 in April 2014. 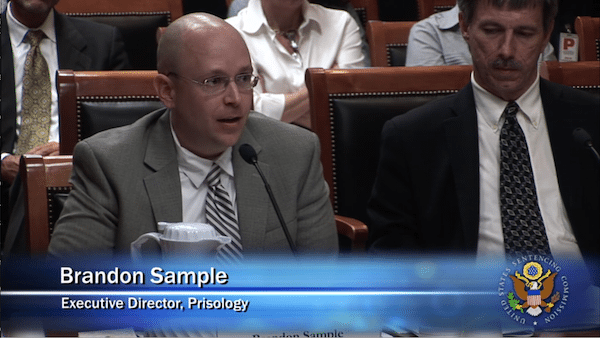 Prisology offered testimony to the Sentencing Commission in June 2014, urging it to make the amendment retroactively applicable to drug offenders already doing time. The Prisology website alone generated over 10,000 comments supporting retroactivity, with another 45,000 letters submitted by federal prisoners, mostly at Prisology’s prompting. The U.S. Sentencing Commission unanimously approved retroactivity in July 2014. Under Amendment 782, offenders became eligible to apply for sentence reductions on November 1, 2014, with the earliest allowable release on or after November 1, 2015. To assure public safety, all sentence reductions will be determined by the courts on a case-by-case basis. In January 2015, the U.S. Sentencing Commission proposed new guidelines to reduce sentences for federal economic crimes, also known as white collar crime. Prisology commends the Commission for this action, and urges it to apply the reforms retroactively to the roughly 8,850 prisoners now doing time for such crimes. The Commission has called for comments on the new proposed guidelines, and Prisology has rallied more than 10,000 of its constituents to comment in support of the changes, with a goal of 30,000 comments by the March 18th Commission deadline. The public is urged to submit comments at prisology.org/action. Prisology is a national nonprofit organization founded in July 2013. We are dedicated to reforming the U.S. criminal justice system through grassroots advocacy, activism, litigation and education. Prisology has offices in Texas and Vermont. Our website is at https://www.prisology.org, where you can find video of Prisology’s U.S. Sentencing Commission Testimony, and a timeline related to Amendment 782’s passage. June 2013 – The U.S. Sentencing Commission solicits public comment on its priorities for the 2014 guideline amendment cycle. July 2013 – Prisology, only weeks old, springs into action, and prompts thousands of support letters which are sent to the Commission requesting an across the board reduction to the federal drug sentencing guideline table. January 2014 – Sentencing Commission formally proposes change to federal drug sentencing guidelines, reducing them by two levels, and solicits public comment on their proposal. Prisology begins grassroots push for public support of guideline change via its website and within the federal prison system. March 2014 – Sentencing Commission holds hearing on proposed amendment to federal drug sentencing guideline. April 2014 – Sentencing Commission unanimously approves drug guideline amendment. Commission Chair notes that they received over 20,000 letters supporting the amendment, most of which came at Prisology’s prompting. Commission seeks public comment on amendment retroactivity, which will make all low level, first time, nonviolent drug offenders currently serving time eligible for reduced sentences and early release under the new guidelines. Prisology renews its public education and outreach effort, using its website, social media, and prison network to prompt a strong grassroots response in support of retroactivity. June 2014 – U.S. Sentencing Commission holds hearing on retroactivity of Amendment 782. Prisology’s Executive Director Brandon Sample testifies in support. Read Prisology’s written testimony here. July 2014 – U.S. Sentencing Commission unanimously approves retroactivity of drug guideline amendment, formally known as Amendment 782. Commission chair acknowledges receipt of over 60,000 letters in support of retroactivity. Prisology’s website alone generated more than 10,000 of those positive public comments. Federal prisoners submitted an additional 45,000 letters, the result of Prisology outreach. November 2014 – Amendment 782 takes effect. Up to 46,000 federal prisoners become eligible to apply for sentence reductions and early release. When fully implemented, the guidelines could save taxpayers $4 billion. November 2015 – Earliest scheduled release of low level, first time, nonviolent drug offenders under the new sentencing guidelines. MONTPELIER – In order to increase public awareness and accountability of federal prison officials, Prisology, a national criminal justice reform organization, filed suit today against the Federal Bureau of Prisons (“BOP”) in U.S. District Court in Washington, DC. The lawsuit alleges that the BOP failed to comply with amendments to the Freedom of Information Act (“FOIA”) which require federal agencies to publish certain records online for public perusal. According to the lawsuit, the BOP is required to publish online all agency responses to prisoner grievances from each BOP institution, Regional Office, and the BOP’s Central Office; private settlements outside of litigation between the BOP and its employees, inmates, and other persons; grants and denials of requests for compassionate release; all settlements, compromises, and rejections of claims made pursuant to the Federal Tort Claims Act and Inmate Accident Compensation Program; and Disciplinary Hearing Officer reports reflecting agency adjudication of serious prison disciplinary charges. Jeremy Gordon, Prisology’s General Counsel, called the litigation “groundbreaking.” “Effective oversight of federal agencies is impossible where lawmakers and the public do not have access to information about agency operations and practices. At present, the BOP largely functions in a shroud of secrecy,” Gordon said. For fiscal year 2015, the BOP has requested nearly $6.9 billion in funding. Despite being one of the most well-funded federal agencies, the BOP is presently operating at 32 percent over capacity, with some 217,000 federal prisoners in its custody. BOP employs over 39,000 people across 119 institutions, six regional offices, and its headquarters in Washington, DC. A copy of the lawsuit can be accessed here.